Or, if you just want to share your favorite place with other readers, comment below! Are we missing your favorite playground? What is it? Where is it? 49 comments to What obvious NJ fave playground are we missing? Liberty State Park! It is probably the hugest playground you’ve seen and you can grill right by it. I see you have done Kid Street in Bridgewater. They are building a fancy kids’ playground in Donaldson Park in Highland Park. Whether it will rate as worth a trip, I don’t know. It’s Middlesex County that owns the park and is doing the building. I like the park behind the Vermuele house in North Plainfield–the house is on the corner of Greenbrook Road and Clinton Ave. very close to Route 22.
always scares me at playgrounds. for bigger kids and to the left one for 1-2 yr olds. Wood chips on the ground and gets muddy after it rains. convenient because there is a bathroom in the library for bathroom breaks. Also, a picnic area. Hey thanks everyone for the comments, I’m going to check em all out, it’ll just take me some time to get to them, I just popped out a 3rd kid 4 months ago, so we’ll be playground hopping for a very long time. If anyone has photos to share, email them to me w/ short description at njplaygrounds@gmail.com, we would love to include them on our site! What a wonderful resource! I agree with Robin: Vermeule in North Plainfield is great. It has a wooden ship and a small castle as well as lots of “typical” equipment. Some other terrific playgrounds you don’t have listed: Hillsborough Municipal Playground on South Branch Rd., Hunterdon Co. is one of the few remaining complex wooden castle playgrounds, this one with a huge sandbox, too. Harry Dunham on Liberty Corner Rd., in Liberty Corner, Bernards Twp., Somerset Co. has several large play structures and a beach volleyball court that doubles as a sandbox. Very nice bathrooms, too. Pleasant Valley, Valley Rd. in Lyons, Bernards Twp., Somerset Co. has two large play structrues and a club house, by a pond with a fountain and lots of shady walking trails, lots more. Grove St. in Chester is a smallish but incredibly high quality playground jam-packed with interesting features. Hillside school, Brown Rd., in Bridgewater, Somerset Co. is an aging wooden playground and another metal and plastic playground, both aimed at older kids, with a slide in the middle of the path to them. Hamilton School, off Washington Valley in Bridgewater, Somerset Co. is a very nice elementary school playground with a lot of unusual equipment. And Rock Spring Park at the top of Schooley’s Mountain Rd. in Morris county is a terrific, compact playground in the midst of huge fields. And for those of us in Somerset county, I also recommend: Chimney Rock and Thomae in Bridgewater, Warren Municipal and Woodland School in Warren, Legion Park in Bound Brook, Mobus Park in Watchung, Gillette School in Long Hill Twp., Columbia Park in Berkeley Heights, Mountainview Park in Middlesex, Duke Island Park in Raritan, Milltown School and North Branch Park in Branchburg, Midland School in Readington, Johnson Park in Piscataway, Top of the World Park in Green Brook, and Green Acres Park in North Plainfield. Or search for Warren, NJ playgrounds on Google Maps for my list of several hundred playgrounds in central NJ. I heard the old Inflation Station has been taken over by another company. They redid the whole place and their web site looks awesome. I think they are haveing a grand opeing in October. Oops, their name is Jumpnasium. Mary what city is this? On Doremus, next to the municipal pool. Large parking lot, but hard to park during pool season. Infant and regular swings. Large wooden jungle gym with slides. Fenced in with only two gated entrances. Behind the playground is the town arboretum. Has a small duck pond, gardens and some small (perfect for toddlers) wooded trails. I love taking my children to Pine Park! It’s a huge park that is very nicely kept up! They have beautiful playground and place to make BBQs, fields to run in… My children love it. But one thing that I think would be very nice- if they can put down Rubber Mulch. My friend has a beautiful yard and she just got Rubberecycle Mulch! My children were so excited there like “Mom how come parks don’t have this”! I mean they children feel much safer, and when they fall it doesn’t hurt them as much! not sure if this qualifies, but it is a great indoor/outdoor solution for free: The Wyckoff Nature Center. It is almost like going to a little zoo, plus there are trails to “hike” as well. In Passaic County, in Bloomingdale, there is a really nice playground on Glenwild Avenue, by a pond. There’s a play set for littler kids (my kids were on there before they were two) and one for bigger kids also. There’s a really pretty gazebo in the middle where moms sit and chat while watching their kids and where we usually eat a lunch. A lovely place to visit if you are in the area, but probably not worth a terribly long ride. White Oak Park in Branchburg (Somerset County). It is located on Baird Road across from Branchburg Central Middle School. It is an active recreation park with tennis courts, baseball and soccer fields, volleyball courts and a great SHADY playground. Its a nice size with several choices of what to play on. I would include Michael J. Tighe Park, in Freehold, NJ, Monmouth County. The playground and sprayground are nice, but the really special feature is the kiddie pool. As far as I know, it’s the only public swimming pool in Monmouth County. Kids have a great time playing in the pool, and adults can wade alongside the kids. The dry playground is free, but they charge a couple of bucks per person for the wet area. 2 large play areas (North and South) and one smaller one(East). Too much to describe! You could literally spend the whole day there. This one is a little bit far away, but it is worth to stop by if you are heading south for a road trip! Annie’s is THE BEST playground I have ever been to, and that’s saying a lot. About 15 minutes off I-95 before you get to Boston. Huge. Wooden castle themed. built in memory of a 6 year old killed by a drunk driver. Absolutely fantastic. (hot in summer tho). Ice skating is top on my list to do with my 3 year old this winter. Here are some places that I will test out. Ice House is an indoor ice skating rink that offers parent/tot classes. Teaching the very basics of skating using fun and interesting games and instructional techniques. Also, Secaucus has an outdoor ice skating rink. The admission is $3 and skate rentals are $2. I will let know how they turn out. Thanks! to add to Nitha’s list – another great indoor place is Spread your wings in Sewell. Didn’t see Turtle Back Zoo – in West Orange. It has been GREATLY improved over the years. Cranbury Village Park in Cranbury NJ (in Middlesex County). This park is so nice, it has a covered pavillon right next to the nice sized playground (1 for toddlers, 1 for older kids, 6 large swings, 2 small swings). The Pavillon has 3 table and bench sets, with 2 fire place like-grills. GREAT for family BBQ’s you can grill AND watch the kiddies. The lake is gorgeous and the gazebo looks prepped for a wedding LOL. LOTS of space to chill out and relax under a tree, play frisbee etc. There is a base ball field, soccer field, tennis court, and Basketball court- only downside is that there are 3 port-a-pottys, instead of real bathrooms- but hey, some parks don’t even have those. According to website (http://www.cranburytownship.org/parks_list.html)VILLAGE PARK – A scenic, active recreational park located on Brainerd Lake. Features ball fields, tennis courts, basketball courts, major playground structures, pavilion, gazebo, picnic areas and grill facilities. Small boat dock facility with access to Brainerd Lake. Terhune Orchards up in Princeton is a fantastic place to take the kids! They have u-pick fruit and veggies, sometimes they have it combined with a storytime and craft, in June there will be a firefly festival, they have animals to see (and feed), plenty of picnic benches in shade or sunshine, toddler ride-on tractors, cats and dogs to pet and a great farmstore to stock up on snacks, drinks and other goodies! is the post I blogged about it. The municipal wood park in Evesham, Burlington County. Is is on Tomlinson Mill Rd, which is an extension of Main Street in Evesham (Marlton) and continues on to Tuckerton Road in Medford. It is a great wood park, with only one entrance. There are picnic tables right at the entrance so you can set up and see your kids coming and going. There are huge playing fields and bathrooms as well. Memory Park on Moran Street in the Town of Newton offers many fields, a basketball court, playground, pool, and public restrooms. Hey! I wanted to add some parks in Passaic County. -Ringwood State Park has a playground and a field on the Ringwood Manor property, as well as playground area by Shepherd Lake. There are picnic tables and grills at both. -The is a very nice play area behind the Ringwood Public Library. There are swings (including a handicapped swing), a freestanding climbing structure, as well as a wooden structure with slides, monkey bars etc. I’ll be back to add more later! There’s a small park that fits your SSEQ title…Muriel Hepner park in Denville off Diamond Spring Rd. Cute park, fenced in with a pond and walking trail available. Not too much shade in the summer so you’d have to go early or late. 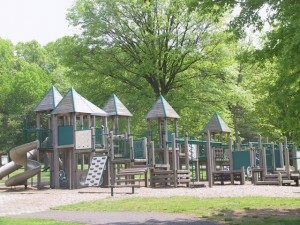 Montville Park at 130 Changebridge Road, Montville NJ 07045 is a great park !!! Another hidden gem is Greenview Park in Pequannock. It has two playgrounds, tennis courts (a third toddler playground hidden behind tennis courts), softball fields, racquetball wall, pond, shuffleboards, picnic tables, BBQ grills, a great hill for sleigh riding in the winter, and best of all BATHROOMS!!! The playground area are shaded and also there is a gazebo so if you wanted to have a small birthday party. GREAT PARK!!! Airplane Park in Wall, NJ is really nice. Fenced in, parking, new equipment, and plenty of space to play. Foothills Park in Pompton Plains, NJ. It’s a nice quiet park set off the main road. Adjacent to it is a nice enclosed dog park which makes for a nice two-fer outing. New Park – Pier A Park IN Hoboken, with sprinklers & sand. Awesome! North Hudson Park in North Bergen – so-so sprinklers, but a great playground, grills & lots of room to run. My favorite park is Taylor Park. Taylor Park is a 16-acre park nestled in the downtown area of Millburn. It features recreational facilities including ball fields, tennis and basketball courts. Also, there are walking paths, a pond and a playground. Additionally, the town’s Bauer Community Center is located inside the park. The best part of the park is that the park includes a kids play area with jungle gyms, swings, slides for age groups starting from infants all the way to 6-8 year olds. The kids park is completely fenced and so you can sit around reading a book while the kids play. The park also has picnic tables, a beautiful pond, baseball fields, basketball courts, tennis courts and athletic fields as well. During the summer a lot of summer camps are held at this park. Parking is on the street but you will find plenty of spots in the inner roads just couple of minutes from the park where it is free. Grover Cleveland Park in Caldwell, NJ off of Bloomfield Avenue(Essex County) is amazing and very shady. It’s got 2 sides to the playground for different ages and a bike path, lake for fishing, and hiking trails too. Also the Community Playground of Montville on Changebridge Road. Not the shadiest, but still a great place to play. 130 Changebridge Rd…..From Route 287 North take exit 47 Montville/Lincoln Park. Make a left onto Route 202. Continue on Route 202 to 1st traffic light. Make a right at this light onto Changebridge Rd. The Park is approximaly a mile and ¼ on your left. Waldwick’s borough park is shady and fenced in. Has activities for different ages. Nice walking path along whites pond. I visited Codrington Park in Bound Brook and it’s really nice. I posted a video I made with my kids too. Great local park!